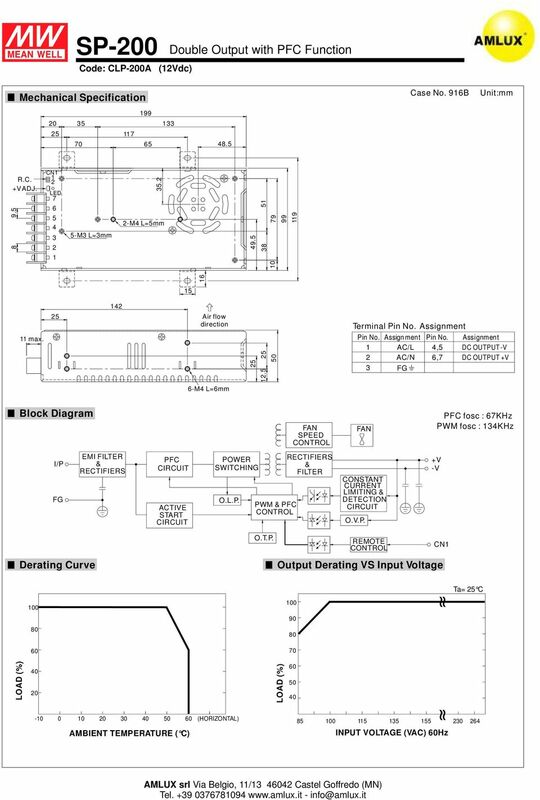 Download "Single Output Switching Power Supply"
1 .. RS- Code: CLP-A Single Output Switching Power Supply SPECIFICATION MODEL OUTPUT INPUT PROTECTION ENVIRONMENT SAFETY EMC (Note 6) OTHERS NOTE DC VOLTAGE RATED CURRENT CURRENT RANGE RATED POWER RIPPLE NOISE (max.) Note. VOLTAGE ADJ. RANGE VOLTAGE TOLERANCE Note. LINE REGULATION Note. LOAD REGULATION Note. SETUP, RISE TIME HOLD UP TIME (Typ.) VOLTAGE RANGE FREQUENCY RANGE EFFICIENCY (Typ.) AC CURRENT (Typ.) INRUSH CURRENT (Typ.) LEAKAGE CURRENT OVERLOAD OVER VOLTAGE OVER TEMPERATURE WORKING TEMP. WORKING HUMIDITY STORAGE TEMP. TEMP. COEFFICIENT VIBRATION SAFETY STANDARDS WITHSTAND VOLTAGE ISOLATION RESISTANCE EMI CONDUCTION RADIATION HARMONIC CURRENT EMS IMMUNITY MTBF DIMENSION PACKING RS-- V.A ~.A.6W mvp-p.8 ~.V ±.% ms, ms/vac 7ms/VAC 8 ~ 6VAC 7 ~ 6Hz 8%.A/VAC COLD START 6A / VAC <ma / VAC Above % rated output power.8 ~ 6.V - ~ +7 C (Refer to output load derating curve) ~ 9% RH non-condensing - ~ +8 C ±.%/ C ( ~ C) ~ Hz, G min./cycle, period for min. 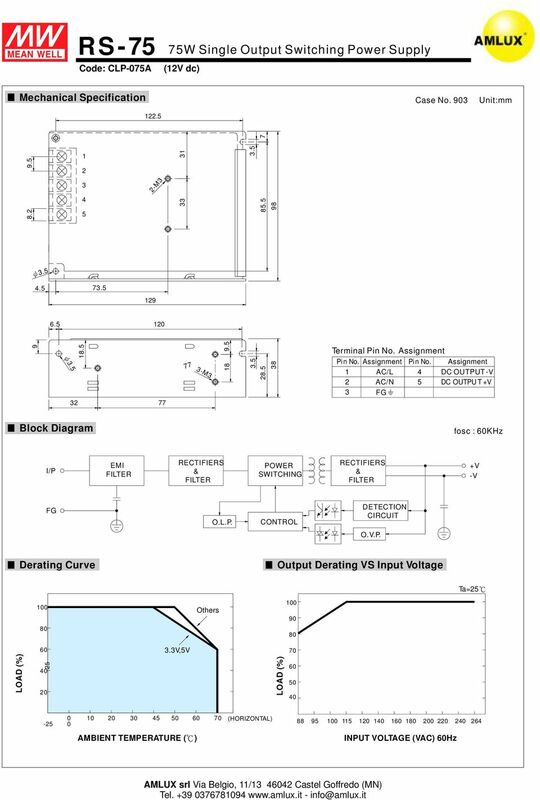 each along X, Y, Z axes UL9-, TUV EN9- approved I/P-O/P:KVAC I/P-:.KVAC O/P-:.KVAC I/P-O/P, I/P-, O/P-:M Ohms/VDC C Compliance to EN (CISPR) Class B Compliance to EN--,- Compliance to EN--,,,, 6, 8,, ENV, EN, EN-6-, criteria A 8.8Khrs min. MIL-HDBK-7F! ( ) 6. **8mm (L*W*H).Kg; 8pcs/Kg/.7CUFT Features : Universal AC input / Full range Protections: Short circuit / Overload / Over voltage / Over temperature Cooling by free air convection LED indicator for power on % full load burn-in test All using C long life electrolytic capacitors Withstand VAC surge input for second High operating temperature up to 7 C Withstand G vibration test High efficiency, long life and high reliability Protection type : Shut off o/p voltage, clamping by zener diode U Tj C typically (U) detect on main control IC Protection type : Shut down o/p voltage, recovers automatically after temperature goes down 7%RH. All parameters NOT specially mentioned are measured at VAC input, rated load and C of ambient temperature.. Ripple noise are measured at MHz of bandwidth by using a " twisted pair-wire terminated with a.uf 7uf parallel capacitor.. Tolerance : includes set up tolerance, line regulation and load regulation.. Line regulation is measured from low line to high line at rated load.. Load regulation is measured from % to % rated load. 6. The power supply is considered a component which will be installed into a final equipment. The final equipment must be re-confirmed that it still meets EMC directives. 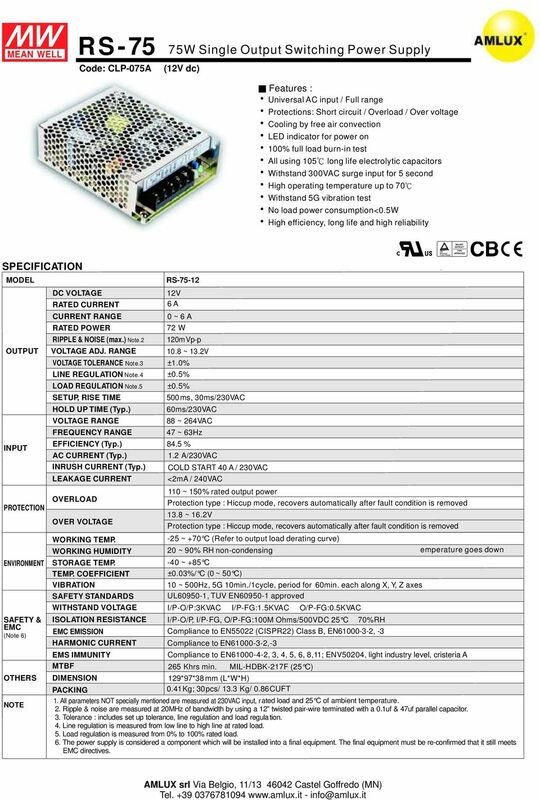 3 .. SPECIFICATION MODEL OUTPUT INPUT PROTECTION ENVIRONMENT SAFETY EMC (Note 6) OTHERS NOTE DC VOLTAGE RATED CURRENT CURRENT RANGE RATED POWER VOLTAGE ADJ. RANGE LINE REGULATION Note. LOAD REGULATION Note. SETUP, RISE TIME HOLD UP TIME (Typ.) VOLTAGE RANGE FREQUENCY RANGE EFFICIENCY (Typ.) AC CURRENT (Typ.) INRUSH CURRENT (Typ.) LEAKAGE CURRENT OVERLOAD OVER VOLTAGE WORKING TEMP. WORKING HUMIDITY STORAGE TEMP. TEMP. 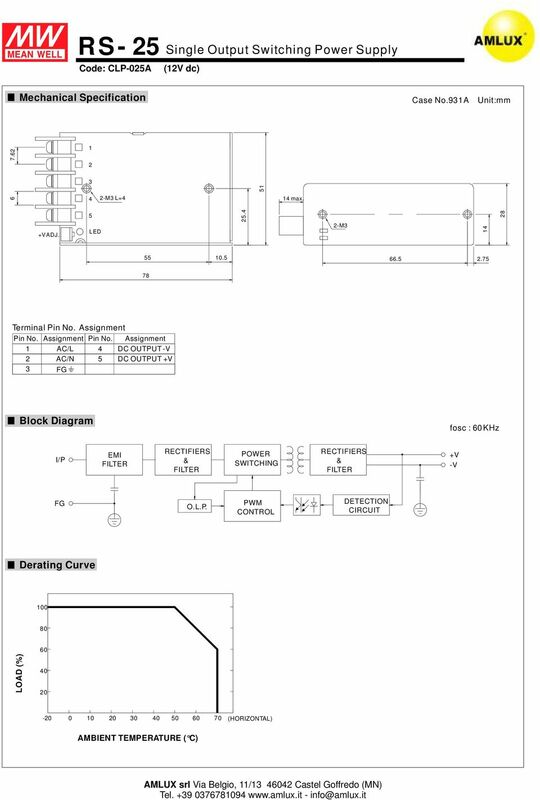 COEFFICIENT VIBRATION SAFETY STANDARDS WITHSTAND VOLTAGE HARMONIC CURRENT EMS IMMUNITY MTBF DIMENSION PACKING R S- Single Output Switching Power Supply Code: CLP-A RIPPLE NOISE (max.) Note. VOLTAGE TOLERANCE Note. ISOLATION RESISTANCE EMI CONDUCTION RADIATION (V dc) RS-- V.A ~.A.W mvp-p.8 ~.V ±.% ms, ms/vac ms/vac 88 ~ 6VAC 7 ~ 6Hz 79%.A/VAC COLD START 6A / VAC <ma / VAC ~ % rated output power.8 ~ 6.V - ~ +7 C (Refer to output load derating curve) ~ 9% RH non-condensing - ~ +8 C ±.%/ C ( ~ C) ~ Hz, G min./cycle, period for min. 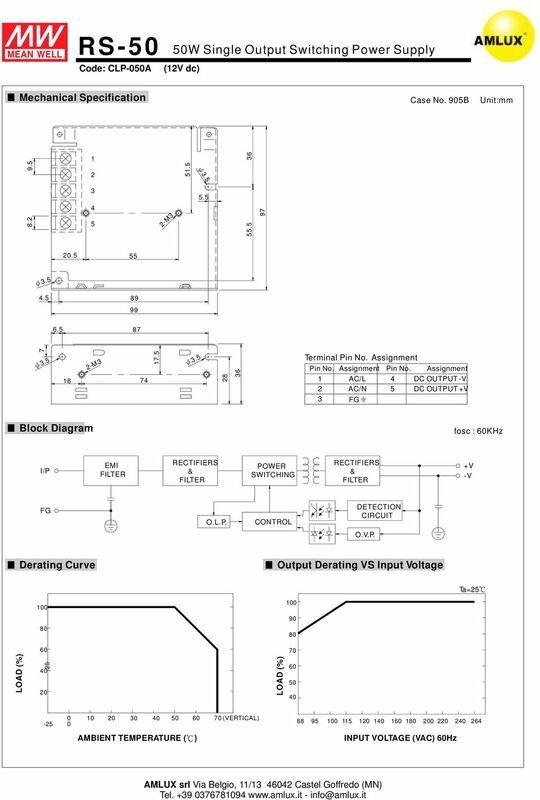 each along X, Y, Z axes UL9-, TUV EN9- approved I/P-O/P:KVAC I/P-:.KVAC O/P-:.KVAC I/P-O/P, I/P-, O/P-:M Ohms/VDC C Compliance to EN (CISPR) Class B Compliance to EN--,- Compliance to EN--,,,, 6, 8,; ENV, light industry level, cristeria A 9.7Khrs min. 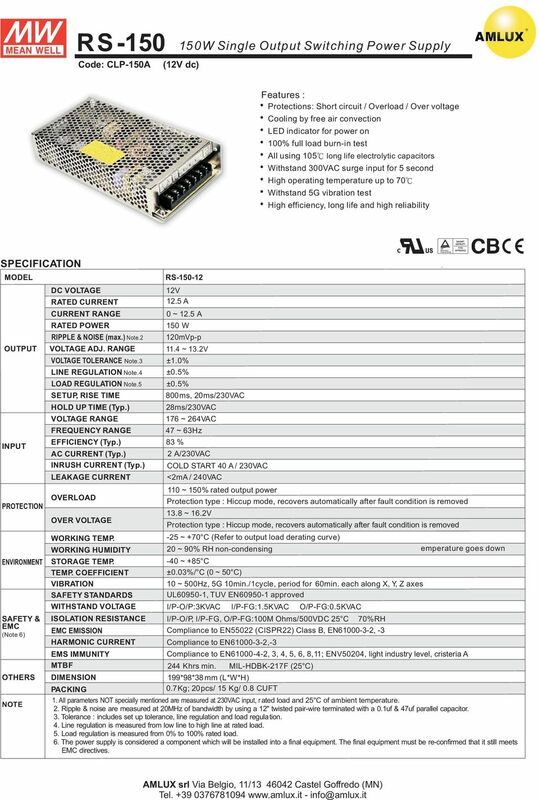 MIL-HDBK-7F ( C) 78**8mm (L*W*H).Kg; 8pcs/Kg/.6CUFT Features : Universal AC input / Full range Protections: Short circuit / Overload / Over voltage Cooling by free air convection LED indicator for power on % full load burn-in test All using C long life electrolytic capacitors Withstand VAC surge input for second High operating temperature up to 7 C Withstand G vibration test High efficiency, long life and high reliability Protection type : Shut off o/p voltage, clamping by zener diode 7%RH emperature goes down. All parameters NOT specially mentioned are measured at VAC input, rated load and C of ambient temperature.. Ripple noise are measured at MHz of bandwidth by using a " twisted pair-wire terminated with a.uf 7uf parallel capacitor.. Tolerance : includes set up tolerance, line regulation and load regulation.. Line regulation is measured from low line to high line at rated load.. Load regulation is measured from % to % rated load. 6. The power supply is considered a component which will be installed into a final equipment. The final equipment must be re-confirmed that it still meets EMC directives. 5 RS- W Single Output Switching Power Supply Code: CLP-A (V dc) Features : Universal AC input / Full range Protections: Short circuit / Overload / Over voltage Cooling by free air convection LED indicator for power on % full load burn-in test All using long life electrolytic capacitors Withstand VAC surge input for second High operating temperature up to 7 Withstand G vibration test No load power consumption<.w High efficiency, long life and high reliability SPECIFICATION MODEL OUTPUT INPUT PROTECTION ENVIRONMENT SAFETY EMC (Note 6) OTHERS NOTE DC VOLTAGE RATED CURRENT CURRENT RANGE RATED POWER RIPPLE NOISE (max.) Note. VOLTAGE ADJ. RANGE VOLTAGE TOLERANCE Note. LINE REGULATION Note. LOAD REGULATION Note. SETUP, RISE TIME HOLD UP TIME (Typ.) VOLTAGE RANGE FREQUENCY RANGE EFFICIENCY (Typ.) AC CURRENT (Typ.) INRUSH CURRENT (Typ.) LEAKAGE CURRENT OVERLOAD OVER VOLTAGE WORKING TEMP. WORKING HUMIDITY STORAGE TEMP. TEMP. COEFFICIENT VIBRATION SAFETY STANDARDS WITHSTAND VOLTAGE ISOLATION RESISTANCE EMC EMISSION HARMONIC CURRENT EMS IMMUNITY MTBF DIMENSION PACKING RS-- V. A ~. A.W mvp-p.8 ~.V ±.% ms, ms/vac ms/vac 88 ~ 6VAC 7 ~ 6Hz 8. %.8A/VAC COLD START A / VAC <ma / VAC ~ % rated output power.8 ~ 6.V - ~ +7 C (Refer to output load derating curve) ~ 9% RH non-condensing - ~ +8 C ±.%/ C ( ~ C) ~ Hz, G min./cycle, period for min. each along X, Y, Z axes UL9-, TUV EN9- approved I/P-O/P:KVAC I/P-:.KVAC O/P-:.KVAC I/P-O/P, I/P-, O/P-:M Ohms/VDC C Compliance to EN (CISPR) Class B, EN--, - Compliance to EN--,- Compliance to EN--,,,, 6, 8,; ENV, light industry level, cristeria A 9.7Khrs min. MIL-HDBK-7F ( C) 99*97*6 mm (L*W*H).Kg; pcs/ 9.Kg/.9CUFT 7%RH emperature goes down. All parameters NOT specially mentioned are measured at VAC input, rated load and C of ambient temperature.. Ripple noise are measured at MHz of bandwidth by using a " twisted pair-wire terminated with a.uf 7uf parallel capacitor.. Tolerance : includes set up tolerance, line regulation and load regulation.. Line regulation is measured from low line to high line at rated load.. Load regulation is measured from % to % rated load. 6. The power supply is considered a component which will be installed into a final equipment. The final equipment must be re-confirmed that it still meets EMC directives. 7 RS-7 Code: CLP-7A 7W Single Output Switching Power Supply (V dc) Features : Universal AC input / Full range Protections: Short circuit / Overload / Over voltage Cooling by free air convection LED indicator for power on % full load burn-in test All using long life electrolytic capacitors Withstand VAC surge input for second High operating temperature up to 7 Withstand G vibration test No load power consumption<.w High efficiency, long life and high reliability SPECIFICATION MODEL OUTPUT INPUT PROTECTION ENVIRONMENT SAFETY EMC (Note 6) OTHERS NOTE DC VOLTAGE RATED CURRENT CURRENT RANGE RATED POWER RIPPLE NOISE (max.) Note. VOLTAGE ADJ. RANGE VOLTAGE TOLERANCE Note. LINE REGULATION Note. LOAD REGULATION Note. SETUP, RISE TIME HOLD UP TIME (Typ.) VOLTAGE RANGE FREQUENCY RANGE EFFICIENCY (Typ.) AC CURRENT (Typ.) INRUSH CURRENT (Typ.) LEAKAGE CURRENT OVERLOAD OVER VOLTAGE WORKING TEMP. WORKING HUMIDITY STORAGE TEMP. TEMP. COEFFICIENT VIBRATION SAFETY STANDARDS WITHSTAND VOLTAGE ISOLATION RESISTANCE EMC EMISSION HARMONIC CURRENT EMS IMMUNITY MTBF DIMENSION PACKING RS-7- V 6 A ~ 6 A 7 W mvp-p.8 ~.V ±.% ms, ms/vac ms/vac 88 ~ 6VAC 7 ~ 6Hz 8. %. A/VAC COLD START A / VAC <ma / VAC ~ % rated output power.8 ~ 6.V - ~ +7 C (Refer to output load derating curve) ~ 9% RH non-condensing - ~ +8 C ±.%/ C ( ~ C) ~ Hz, G min./cycle, period for min. 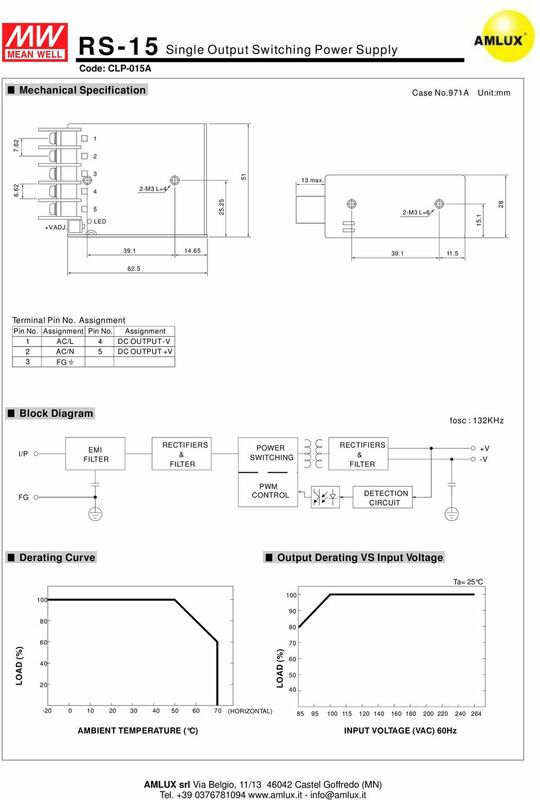 each along X, Y, Z axes UL9-, TUV EN9- approved I/P-O/P:KVAC I/P-:.KVAC O/P-:.KVAC I/P-O/P, I/P-, O/P-:M Ohms/VDC C Compliance to EN (CISPR) Class B, EN--, - Compliance to EN--,- Compliance to EN--,,,, 6, 8,; ENV, light industry level, cristeria A 6 Khrs min. MIL-HDBK-7F ( C) 9*97*8 mm (L*W*H).Kg; pcs/. Kg/.86CUFT 7%RH emperature goes down. All parameters NOT specially mentioned are measured at VAC input, rated load and C of ambient temperature.. Ripple noise are measured at MHz of bandwidth by using a " twisted pair-wire terminated with a.uf 7uf parallel capacitor.. Tolerance : includes set up tolerance, line regulation and load regulation.. Line regulation is measured from low line to high line at rated load.. Load regulation is measured from % to % rated load. 6. The power supply is considered a component which will be installed into a final equipment. The final equipment must be re-confirmed that it still meets EMC directives. 9 RS- Code: CLP-A (V dc) W Single Output Switching Power Supply Features : Universal AC input / Full range Protections: Short circuit / Overload / Over voltage Cooling by free air convection LED indicator for power on % full load burn-in test All using Withstand VAC surge input for second High operating temperature up to 7 Withstand G vibration test long life electrolytic capacitors High efficiency, long life and high reliability SPECIFICATION MODEL OUTPUT INPUT PROTECTION ENVIRONMENT SAFETY EMC (Note 6) OTHERS NOTE DC VOLTAGE RATED CURRENT CURRENT RANGE RATED POWER RIPPLE NOISE (max.) Note. VOLTAGE ADJ. RANGE VOLTAGE TOLERANCE Note. LINE REGULATION Note. LOAD REGULATION Note. SETUP, RISE TIME HOLD UP TIME (Typ.) VOLTAGE RANGE FREQUENCY RANGE EFFICIENCY (Typ.) AC CURRENT (Typ.) INRUSH CURRENT (Typ.) LEAKAGE CURRENT OVERLOAD OVER VOLTAGE WORKING TEMP. WORKING HUMIDITY STORAGE TEMP. TEMP. COEFFICIENT VIBRATION SAFETY STANDARDS WITHSTAND VOLTAGE ISOLATION RESISTANCE EMC EMISSION HARMONIC CURRENT EMS IMMUNITY MTBF DIMENSION PACKING RS-- V 8. A ~ 8. A W mvp-p. ~.V ±.% ms, ms/vac ms/vac 88 ~ 6VAC 7 ~ 6Hz 8 %. A/VAC COLD START A / VAC <ma / VAC ~ % rated output power.8 ~ 6.V - ~ +7 C (Refer to output load derating curve) ~ 9% RH non-condensing - ~ +8 C ±.%/ C ( ~ C) ~ Hz, G min./cycle, period for min. 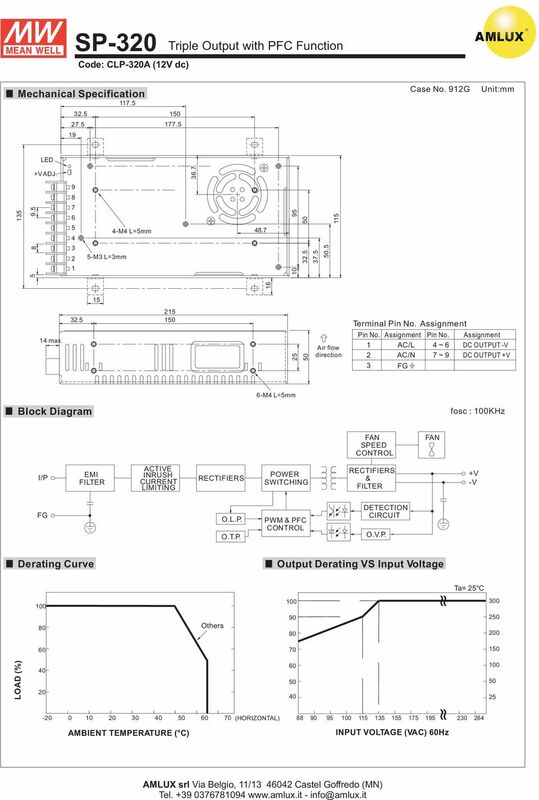 each along X, Y, Z axes UL9-, TUV EN9- approved I/P-O/P:KVAC I/P-:.KVAC O/P-:.KVAC I/P-O/P, I/P-, O/P-:M Ohms/VDC C Compliance to EN (CISPR) Class B, EN--, - Compliance to EN--,- Compliance to EN--,,,, 6, 8,; ENV, light industry level, cristeria A.8 Khrs min. MIL-HDBK-7F ( C) 9*97*8 mm (L*W*H).6Kg; pcs/. Kg/.7CUFT 7%RH emperature goes down. All parameters NOT specially mentioned are measured at VAC input, rated load and C of ambient temperature.. Ripple noise are measured at MHz of bandwidth by using a " twisted pair-wire terminated with a.uf 7uf parallel capacitor.. Tolerance : includes set up tolerance, line regulation and load regulation.. Line regulation is measured from low line to high line at rated load.. Load regulation is measured from % to % rated load. 6. The power supply is considered a component which will be installed into a final equipment. The final equipment must be re-confirmed that it still meets EMC directives. 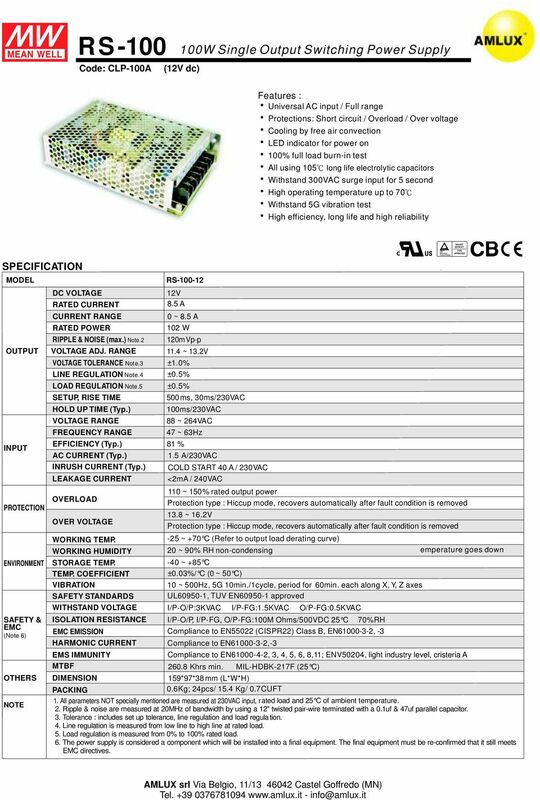 11 RS- Code: CLP-A (V dc) W Single Output Switching Power Supply Features : Protections: Short circuit / Overload / Over voltage Cooling by free air convection LED indicator for power on % full load burn-in test All using long life electrolytic capacitors Withstand VAC surge input for second High operating temperature up to 7 Withstand G vibration test High efficiency, long life and high reliability SPECIFICATION MODEL OUTPUT INPUT PROTECTION OTHERS NOTE DC VOLTAGE RATED CURRENT CURRENT RANGE RATED POWER RIPPLENOISE(max.)Note. VOLTAGE ADJ. RANGE VOLTAGE TOLERANCE Note. LINE REGULATION Note. LOAD REGULATION Note. SETUP, RISE TIME HOLD UP TIME (Typ.) VOLTAGE RANGE FREQUENCY RANGE EFFICIENCY (Typ.) AC CURRENT (Typ.) INRUSH CURRENT (Typ.) LEAKAGE CURRENT OVERLOAD OVER VOLTAGE WORKING TEMP. WORKING HUMIDITY ENVIRONMENT STORAGE TEMP. TEMP. 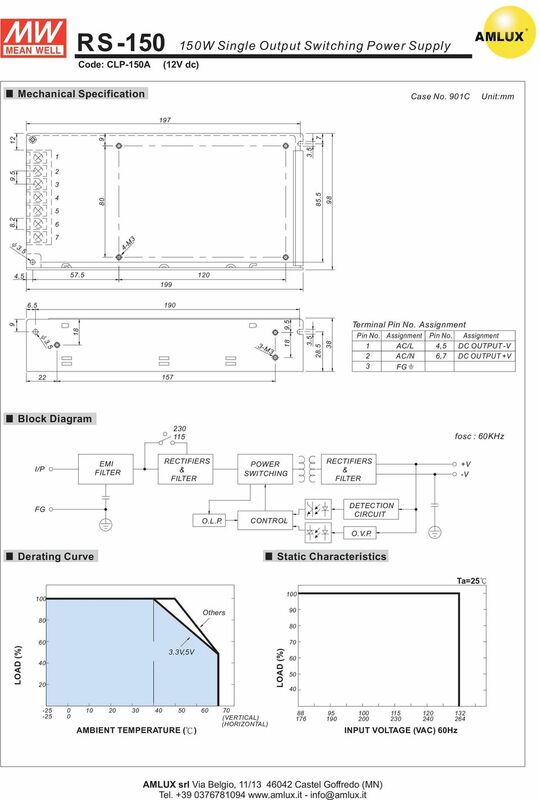 COEFFICIENT VIBRATION SAFETY EMC (Note 6) SAFETY STANDARDS WITHSTAND VOLTAGE ISOLATION RESISTANCE EMC EMISSION HARMONIC CURRENT EMS IMMUNITY MTBF DIMENSION PACKING RS-- V. A ~. A W mvp-p. ~.V ±.% ms, ms/vac 8ms/VAC 76 ~ 6VAC 7 ~ 6Hz 8 % A/VAC COLD START A / VAC <ma / VAC ~ % rated output power.8 ~ 6.V - ~ +7 C (Refer to output load derating curve) ~ 9% RH non-condensing emperature goes down -~+8 C ±.%/ C ( ~ C) ~ Hz, G min./cycle, period for min. each along X, Y, Z axes UL9-, TUV EN9- approved I/P-O/P:KVAC I/P-:.KVAC O/P-:.KVAC I/P-O/P, I/P-, O/P-:M Ohms/VDC C 7%RH Compliance to EN (CISPR) Class B, EN--, - Compliance to EN--,- Compliance to EN--,,,, 6, 8,; ENV, light industry level, cristeria A Khrs min. 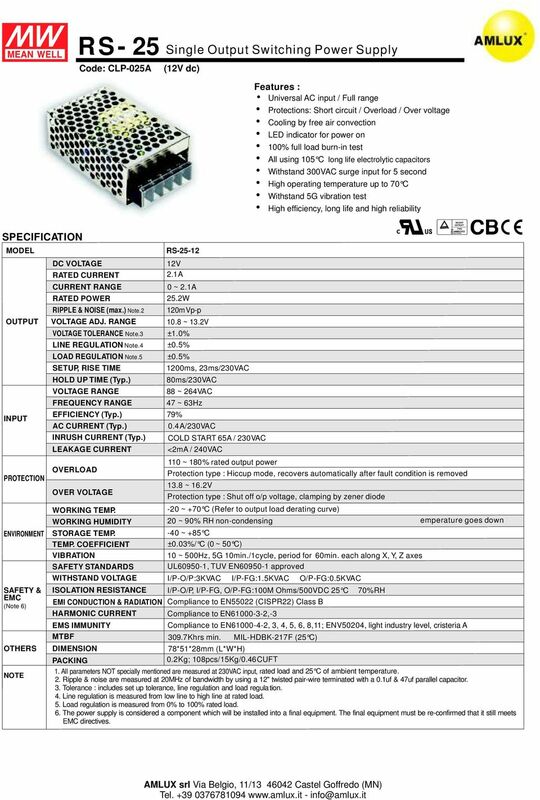 MIL-HDBK-7F ( C) 99*98*8 mm (L*W*H).7Kg; pcs/ Kg/.8 CUFT. All parameters NOT specially mentioned are measured at VAC input, rated load and C of ambient temperature.. Ripple noise are measured at MHz of bandwidth by using a " twisted pair-wire terminated with a.uf 7uf parallel capacitor.. Tolerance : includes set up tolerance, line regulation and load regulation.. Line regulation is measured from low line to high line at rated load.. Load regulation is measured from % to % rated load. 6. The power supply is considered a component which will be installed into a final equipment. The final equipment must be re-confirmed that it still meets EMC directives. 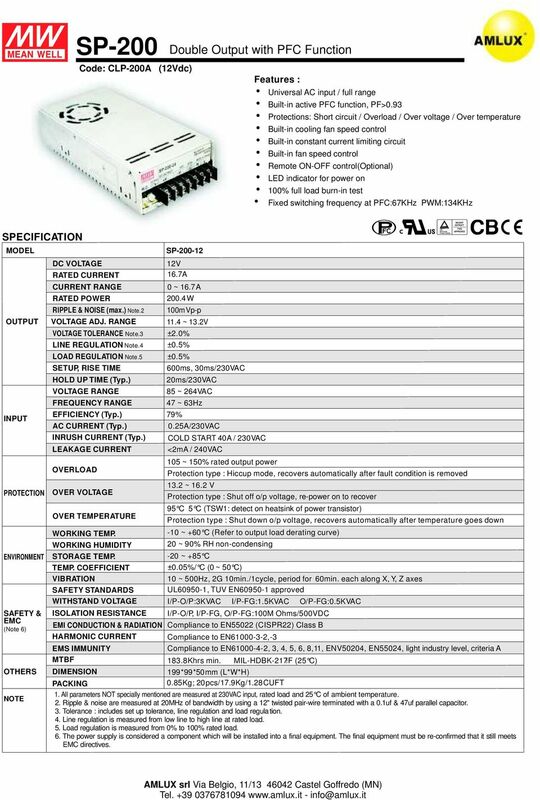 13 .. SP- Code: CLP-A (Vdc) Double Output with PFC Function Features : Universal AC input / full range Built-in active PFC function, PF>.9 Protections: Short circuit / Overload / Over voltage / Over temperature Built-in cooling fan speed control Built-in constant current limiting circuit Built-in fan speed control Remote ON-OFF control(optional) LED indicator for power on % full load burn-in test Fixed switching frequency at PFC:67KHz PWM:KHz SPECIFICATION MODEL OUTPUT INPUT PROTECTION ENVIRONMENT SAFETY EMC (Note 6) OTHERS NOTE DC VOLTAGE RATED CURRENT CURRENT RANGE RATED POWER RIPPLE NOISE (max.) Note. VOLTAGE ADJ. RANGE VOLTAGE TOLERANCE Note. LINE REGULATION Note. LOAD REGULATION Note. SETUP, RISE TIME HOLD UP TIME (Typ.) VOLTAGE RANGE FREQUENCY RANGE EFFICIENCY (Typ.) AC CURRENT (Typ.) INRUSH CURRENT (Typ.) LEAKAGE CURRENT OVERLOAD OVER VOLTAGE OVER TEMPERATURE WORKING TEMP. WORKING HUMIDITY STORAGE TEMP. TEMP. COEFFICIENT VIBRATION SAFETY STANDARDS WITHSTAND VOLTAGE ISOLATION RESISTANCE EMI CONDUCTION RADIATION HARMONIC CURRENT EMS IMMUNITY MTBF DIMENSION PACKING SP-- V 6.7A ~ 6.7A.W mvp-p. ~.V ±.% ms, ms/vac ms/vac 8 ~ 6VAC 7 ~ 6Hz 79%.A/VAC COLD START A / VAC <ma / VAC ~ % rated output power. ~ 6. V Protection type : Shut off o/p voltage, re-power on to recover 9 C C (TSW: detect on heatsink of power transistor) Protection type : Shut down o/p voltage, recovers automatically after temperature goes down - ~ + C (Refer to output load derating curve) ~ 9% RH non-condensing - ~ +8 C ±.%/ C ( ~ C) ~ Hz, G min./cycle, period for min. 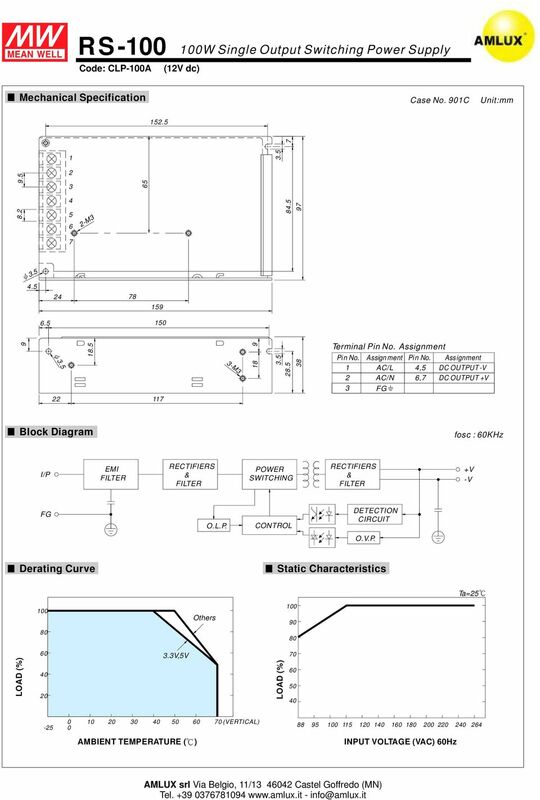 each along X, Y, Z axes UL9-, TUV EN9- approved I/P-O/P:KVAC I/P-:.KVAC O/P-:.KVAC I/P-O/P, I/P-, O/P-:M Ohms/VDC Compliance to EN (CISPR) Class B Compliance to EN--,- Compliance to EN--,,,, 6, 8,, ENV, EN, light industry level, criteria A 8.8Khrs min. MIL-HDBK-7F! ( C) 99*99*mm (L*W*H).8Kg; pcs/7.9kg/.8cuft. All parameters NOT specially mentioned are measured at VAC input, rated load and C of ambient temperature.. Ripple noise are measured at MHz of bandwidth by using a " twisted pair-wire terminated with a.uf 7uf parallel capacitor.. Tolerance : includes set up tolerance, line regulation and load regulation.. Line regulation is measured from low line to high line at rated load.. Load regulation is measured from % to % rated load. 6. The power supply is considered a component which will be installed into a final equipment. The final equipment must be re-confirmed that it still meets EMC directives. 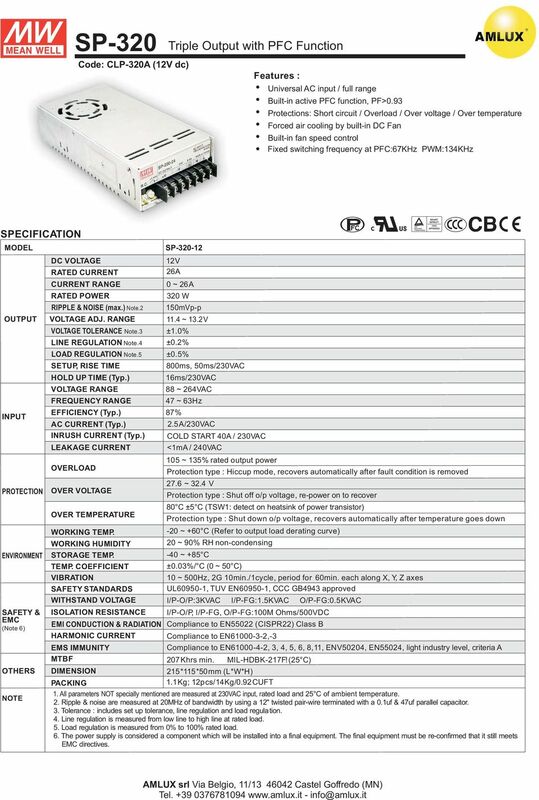 15 SP- Code: CLP-A (V dc) Triple Output with PFC Function Features : Universal AC input / full range Built-in active PFC function, PF>.9 Protections: Short circuit / Overload / Over voltage / Over temperature Forced air cooling by built-in DC Fan Built-in fan speed control Fixed switching frequency at PFC:67KHz PWM:KHz SPECIFICATION MODEL OUTPUT INPUT PROTECTION DC VOLTAGE RATED CURRENT CURRENT RANGE RATED POWER RIPPLENOISE(max.)Note. VOLTAGE ADJ. RANGE VOLTAGE TOLERANCE Note. LINE REGULATION Note. LOAD REGULATION Note. SETUP, RISE TIME HOLD UP TIME (Typ.) VOLTAGE RANGE FREQUENCY RANGE EFFICIENCY (Typ.) AC CURRENT (Typ.) INRUSH CURRENT (Typ.) LEAKAGE CURRENT OVERLOAD OVER VOLTAGE OVER TEMPERATURE SP-- V 6A ~6A W mvp-p. ~.V ±.% ±.% ms, ms/vac 6ms/VAC 88 ~ 6VAC 7 ~ 6Hz 87%.A/VAC COLD START A / VAC <ma / VAC ~ % rated output power 7.6 ~. V Protection type : Shut off o/p voltage, re-power on to recover C ± C (TSW: detect on heatsink of power transistor) Protection type : Shut down o/p voltage, recovers automatically after temperature goes down ENVIRONMENT WORKING TEMP. WORKING HUMIDITY STORAGE TEMP. TEMP. COEFFICIENT VIBRATION -~+ C(Refertooutputloadderatingcurve) ~ 9% RH non-condensing - ~ +8 C ±.%/ C ( ~ C) ~ Hz, G min./cycle, period for min. 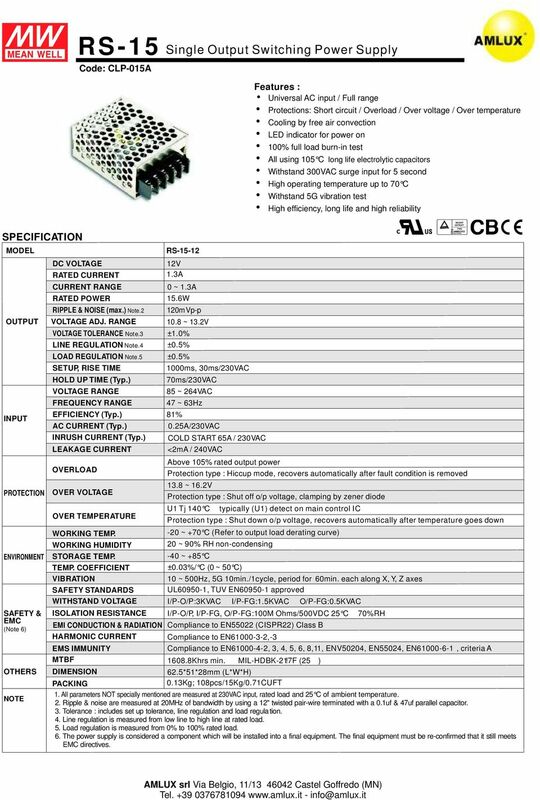 each along X, Y, Z axes SAFETY STANDARDS UL9-, TUV EN9-, CCC GB9 approved WITHSTAND VOLTAGE I/P-O/P:KVAC I/P-:.KVAC O/P-:.KVAC SAFETY ISOLATION RESISTANCE I/P-O/P, I/P-, O/P-:M Ohms/VDC EMC (Note 6) EMI CONDUCTION RADIATION Compliance to EN (CISPR) Class B HARMONIC CURRENT EMS IMMUNITY Compliance to EN--,- Compliance to EN--,,,, 6, 8,, ENV, EN, light industry level, criteria A MTBF 7 Khrs min. MIL-HDBK-7F! ( C) OTHERS DIMENSION PACKING **mm (L*W*H).Kg; pcs/kg/.9cuft NOTE. All parameters NOT specially mentioned are measured at VAC input, rated load and C of ambient temperature.. Ripple noise are measured at MHz of bandwidth by using a " twisted pair-wire terminated with a.uf 7uf parallel capacitor.. Tolerance : includes set up tolerance, line regulation and load regulation.. Line regulation is measured from low line to high line at rated load.. Load regulation is measured from % to % rated load. 6. The power supply is considered a component which will be installed into a final equipment. The final equipment must be re-confirmed that it still meets EMC directives. PB-1000 series. 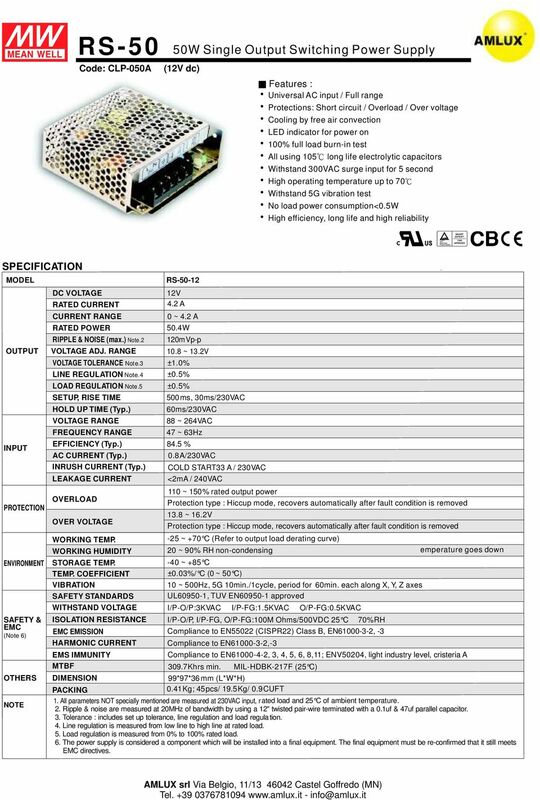 1000W Intelligent Single Output Battery Charger SPECIFICATION MODEL PB-1000-12 PB-1000-24 PB-1000-48 14.4V 28.8V 57.6V 13. A-35 LED VE AYDINLATMA REKLAM SAN. TİC. LTD. ŞTİ.